A few days ago, the social enterprise called The Skateroom launched a new, limited-edition series of decks at the Marciano Art Foundation in Los Angeles to support two initiatives promoting the skate culture as a bottom-up driver of social change for good causes. For a while now, Livegreenblog has been following initiatives that focus on sport as a driver of social change. So, on a number of occasions we have shared projects by NGO Skateistan, from its first initiatives in Afghanistan, where we presented the new sports facility in Mazar-e-Sharif, northern Afghanistan (link), through to South Africa and Cambodia, where this year they opened a 500-square-metre skatepark (link). 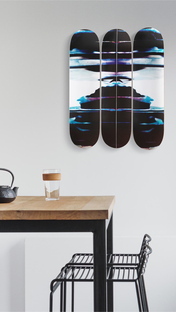 Designed by the architects from Atelier Cole and built in collaboration with Building Trust International, the funds needed for the school were raised by the social enterprise The Skateroom, which supports youth through art and skateboarding, selling limited edition designer skateboards. 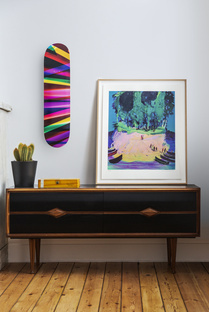 Now, The Skateroom has launched three new limited edition designer skateboards at the Marciano Foundation in Los Angeles, teaming up with leading American contemporary artists Walead Beshty and Kelley Walker. Walead Beshty’s work explores the many ways to conceive and develop photographic images, as well as photography’s relationship to reality. His photographs encourage the viewer to consider the meaning, purpose and significance of each space as it exists within a moment in time. For his Skateroom edition, Beshty presents the latest twist on these camera-less photographs, elegant photograms that strike at you with crossing lines and curvature. He curls paper during its exposure to cyan, magenta, and yellow light, creating a deck print that results in a stack of ever-changing bands, both in colour and tone. Post-conceptual artist Kelley Walker is known for his appropriation of advertising media jargon and cultural images to expose the flaws within society. Key to this is the inclusion of facsimiles, purposefully defaced to represent the complex relationship between individual and system. 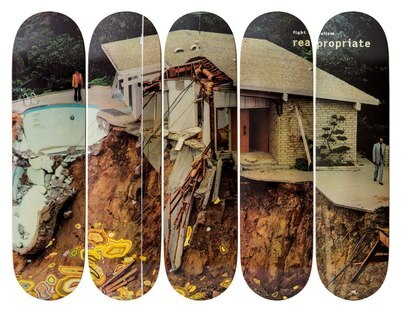 For his five decks series, Walker reproduces a large format photographic image of a swimming pool dangling off a cliff edge, while the owner stares stonily into the wreckage. At the bottom of the image, computer-generated forms tumble into a pile of psychedelic rubble. 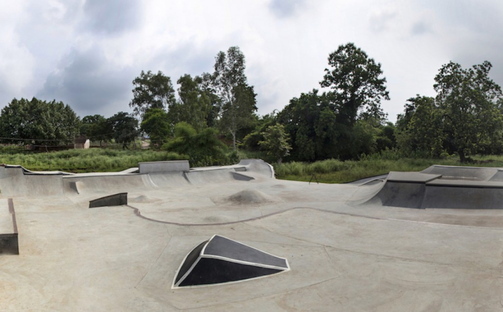 The two artists support The Skateroom through both NGO Skateistan for the upkeep of the facilities and an initiative in rural India called the Janwaar Castle Community Organisation. 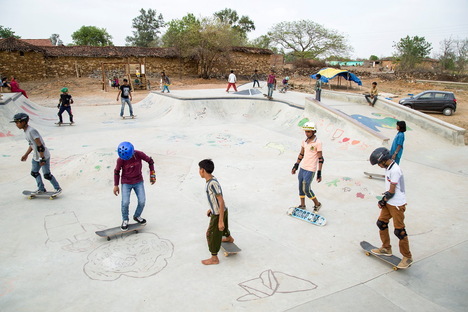 Inspired by the Skateistan example, at the end of 2014 German publisher, author, and futurist Ulrike Reinhard, and Shyamendra Singh began looking for a creative solution to multiple problems of the Indian mass population, with 800+ million people who live in 70,000+ villages of India, often living without even the most basic services like running water and electricity. Here too, skateboarding acts as a driver of social change, as you can see clearly in this video (<iframe width="560" height="315" src="https://www.youtube.com/embed/O5pAzpwXr60" frameborder="0" allow="accelerometer; autoplay; encrypted-media; gyroscope; picture-in-picture" allowfullscreen></iframe>). Small, simple architectural interventions enable the children, and as a consequence their families to expand their horizons, in particular getting girls and young ladies involved in this sport. These new editions are on show at the Marciano Art Foundation in Los Angeles that exhibits a diverse and compelling collection, built by a family that is passionate and dedicated to the arts, aiming to encourage curiosity and contemplation of art and the ways it impacts and enriches our lives.